Gravitational waves—ripples in the fabric of space-time—have been observed for the second time, by an international team of scientists that includes UMD physicists. 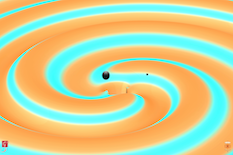 Like the historic first detection announced this past February, these gravitational waves were also generated by the merger of two black holes. The ability to detect these waves, created by violent cosmic collisions, excites scientists because it provides a new way to observe the universe, to “hear” a previously undetectable soundtrack of the cosmos. Both of the twin Laser Interferometer Gravitational-Wave Observatory (LIGO) detectors—located in Livingston, Louisiana, and Hanford, Washington—detected this gravitational wave event, named GW151226. The LIGO Scientific Collaboration (LSC) and the Virgo Collaboration used data from the twin LIGO detectors to make the discovery, which is accepted for publication in the journal Physical Review Letters. LIGO’s first detection on September 14, 2015 resulted from a merger of two black holes 36 and 29 times the mass of the sun. In contrast, the black holes that created the second event were relative flyweights, tipping the scales at 14 and eight times the mass of the sun. Their merger produced a single, more massive spinning black hole that is 21 times the mass of the sun, and transformed an additional sun’s worth of mass into gravitational energy. “It's fabulous that our waveform models have pulled out from the noise such a weak but incredibly valuable gravitational wave signal,” said Alessandra Buonanno, a UMD College Park Professor of Physics and LSC principal investigator who also has an appointment as Director at the Max Planck Institute for Gravitational Physics in Potsdam, Germany. Buonanno has led the effort to develop highly accurate models of gravitational waves that black holes would generate in the final process of orbiting and colliding with each other. The merger occurred approximately 1.4 billion years ago. The detected signal comes from the last 27 orbits of the black holes before their merger. Based on the arrival time of the signals—the Livingston detector measured the waves 1.1 milliseconds before the Hanford detector—researchers can roughly determine the position of the source in the sky. The research paper, “GW151226: Observation of Gravitational Waves from a 22 Solar-mass Binary Black Hole Coalescence,” by the LIGO Scientific Collaboration and the Virgo Collaboration, has been accepted for publication in the journal Physical Review Letters.